Happy Sunday evening, Friends. This is the moment I've been waiting for. I have been wanting to share with you something that may just change your life forever. Let me just ask you: Are you sick and tired of being sick and tired? Are you ready to take control of your finances? 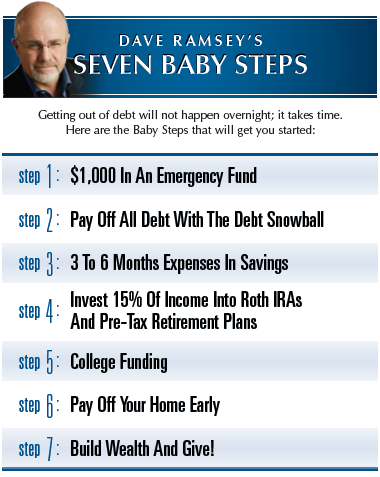 If you are ready to make changes to your spending and saving habits that will not only impact you for the rest of your life, but will also have a lasting impact on your children, I want to invite you to join the millions around the world who are following Dave Ramsey's 7 Baby Steps to financial freedom. As I've said many times before, I am not a qualified professional. I am simply a friend who wants to help you, no matter who you are and no matter where you are in your financial adventure. I want to give you hope that you can get out of debt (if you have any), build wealth and reach your goals. I truly, truly believe that by combining Dave Ramsey's 7 Baby Steps, advice and guidance from Martin Lewis (and others) and penny-sized mindset changes that I share with you, you will be able to accomplish big things with your money. I will be breaking these baby steps down into smaller penny-sized sub-steps every Monday over the next 8 weeks, again, combining information from various UK-based sources. There is also a great UK-based Facebook page called "Dave Ramsey UK Based Support Group" that I am a member of and encourage you to be a part of, too, to gain support from other followers of the DR plan. If you know a friend or family member who could benefit from these steps and the guidance I give, please invite them to subscribe to this blog and/or follow Finding the Pennies on Facebook. Perhaps you're wondering where my husband and I are on this plan. We're on Baby Steps 4, 5 and 6, which are done simultaneously; however, to be honest, we do owe family friends some money which will be paid back in full by May. We have a fully-funded emergency fund in our current account. Although we do contribute a good chunk of money towards our pensions and extra retirement savings every month, we haven't actually checked whether this is 15% of our household income - we definitely need to do this! We do save towards our girls' university fees - more on this in the next few weeks. We would absolutely LOVE to pay off our mortgage early, which seems so far off at this point, but that is our goal. We already give generously as part of our Christian beliefs every month - again, more on this another time. As you can see, we also have some work to do on our finances... I often say that there's always room for improvement! I truly hope you join me on this plan. If I can support you in any way at any time, please let me know. I hope you join me tomorrow evening to discuss Baby Step 0!